Lauterbrunnen is small ancient Walser village. It takes its name from the beautiful waterfalls. “Lauter Brunnen” means “many fountains”, referring to the impressive 72 waterfalls that pour down rock faces along the valley. Lauterbrunnen world famous landmark is the legendary Staubbach Falls, Switzerland’s highest waterfall situated at the far end of the village, and which drop 300m from the cliffs above down into the valley. With frozen waterfalls in the area, cliff faces rising vertically from the valley floor and traditional wooden chalets - Lauterbrunnen's Valley has become a 'must see' for those visiting the Bernese Oberland region. Lauterbrunnen is located in the Swiss canton of Bern and is home to about 3,065 permanent residents. The river Weisse Lütschine flows through Lauterbrunnen. This delightful skiing resort is nestled between Murren and Wengen ski resorts and is part of the Jungfrau ski area. One of the fun highlights in Lauterbrunnen is the toboggan run to Isenfluh. This pretty little village has one main street with a number of hotels, bars, restaurants and shops. Lauterbrunnen is a good option for anyone wanting a cheaper and even quieter base than equivalent accommodation up in Murren and Wengen. This small and relaxed village is a good base to explore the region. It can offer wonderful accommodation, hotels and apartment rentals are charming and homely. And there are plenty other activities to offer off the slopes, like cross-country skiing, sledging, winter hiking, ice-skating, curling and snow-shoeing. Visitors to this charming resort will want to come back year after year. Although Switzerland is famous for its efficient rail network, we still recommend you to order direct airport transfer to get to your chosen destination. That is the most convenient and time-saving option. If you want to use public transport there is a train station in Lauterbrunnen, which is walkable (15 minutes walk from the city centre). We carefully calculate all resort transfer services individually, to make sure that our customers never overpay. Whenever you choose to travel and whatever your final destination, Alps 2 Alps will get you there for the best possible price. However, we advise booking early to access the best possible deal. In addition, keep up to date with Alps 2 Alps for the latest offers, deals and discounts on Lauterbrunnen ski resort transfer services. All of the above will only ever result in our base-rate for ski transfers going down – we never over-inflate our prices at any time or for any reason. We also offer substantial discounts for off-peak, off-season and midweek transfers to Lauterbrunnen. If looking for the best possible deals, travelling outside peak season or midweek typically results in the biggest savings. We offer midweek (Monday to Friday) prices with up to 60% discount than weekend prices. Your transfer quote will also depend on vehicle availability, transfer schedule, vehicle utilisation and other costs like road tolls and airport parking charges. In all instances, we work hard to keep our prices low and are relentlessly committed to total value for money. Which is why we guarantee you won’t find a better deal on your Lauterbrunnen resort transfers, whatever your needs. The resort of Lauterbrunnen lies at an elevation of 800m, with a max vertical of 2,171m and its highest lift going as far as 2,971m. There are a total of 26 pistes in the immediate vicinity of the resort, served by 15 ski lifts. Around 20% of the slopes are ideal for beginners, 60% serve the needs of intermediates and the remaining 20% are for experts. The appropriate ski Lift Pass will allow you to ski or snowboard in the other Jungfrau Region ski resorts of Murren, Wengen and Grindelwald. Jungfrau ski area can offer you the access to 378km of downhill skiing, with 131 individual pistes, served by 66 ski lifts. 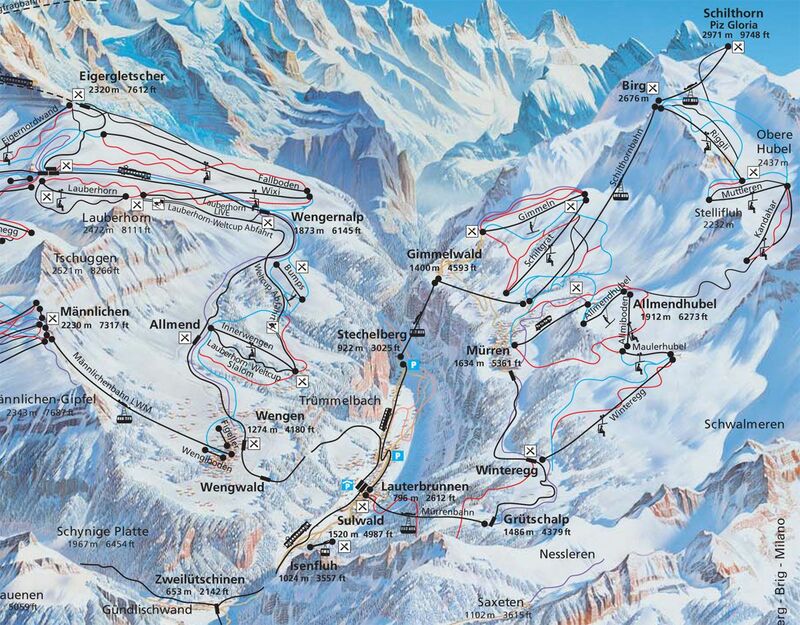 Lauterbrunnen ski resort is a good base if you are planning to ski both Wengen and Murren's ski areas. Lauterbrunnen ski resort is an ideal choice for family ski holidays, the valley is very accessible for kids. Trummelbach Falls is a "must see" when in Lauterbrunnen - unlike most falls, here kids can walk inside the falls, through tunnels of rock carved by the forces of water. Excellent ski schools and kids care facilities make this peaceful village a dream destination for family ski holidays in Switzerland. The way we see it, Lauterbrunnen ski resort transfers are about so much more than getting you to your chosen destination. After all, you also want to arrive comfortable, refreshed and ideally on time. Not all resort transfer services can promise this – Alps2Alps guarantees a higher-level service for every passenger. Have a look at our website to be aware of deals, discounts and special offers that could make your trip even more affordable. If looking to secure your seats for the best possible price, booking as early as possible is advisable.